Here are some work in progress and finished pics of my mural from Arte Calle Street art festival in Quito Ecuador! Arte Callejero Ecuador – Two solid weeks of painting. The two symbols on the outside represent the Protector Spirits: The kind of love that is fierce and fiery. The two winged Angels represent the Spirits of the Andes Mountains, and the Sun God in the center represents the benevolent Creator. The intention of the mural is to be a light-working billboard for the Ancient Spirits of the Earth and Stars who are watching over us and loving us, always ready to help us when we call upon them. Something truly Magical and synchronous happened today as I was finishing the mural: I was painting my signature, and saying my prayer to the Spirits and Ancestors of the land there, for whom I painted the mural. As I was doing this, I began to hear the roar of chanting and drums from down the street. Suddenly a huge parade of people came marching up the street! A group of Amazonian Women form small villages came to Quito and organized a big march to protest the destruction of the rainforest for Oil drilling! “THE FOREST IS NOT FOR SALE” they were chanting! So grateful and thankful for this affirmation from Spirit and to be a part of something bigger. See the Video. 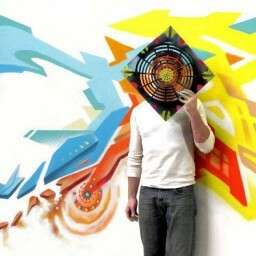 For the last decade, Xavi has been an active participant in the global Visionary Art movement, bringing his vibrant paintings, live murals and art installations to festivals and venues around the world. Xavi now lives and works in California USA.